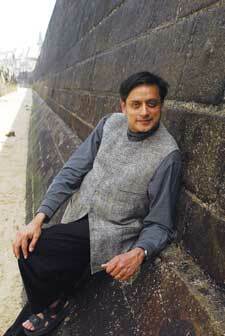 Shashi Tharoor: The Next UN Secretary General? With his recent nomination for the top job of the Secretary General of the United Nations, Tharoor may get a chance to manifest those concerns in even more powerful ways, getting involved in life and death decisions across the world and channeling nations toward peace, health and prosperity. Writing has always been interwoven with his work-life. He is the winner of several awards, including the Commonwealth Writers’ Prize. His books include Reasons of State, The Great Indian Novel, Show Business and India: From Midnight to the Millennium (1997). In an exclusive interview Shashi Tharoor talks with Little India about life since his nomination as UN Secretary General. Q: How has your life changed since India nominated you for the post of the United Nations Secretary General? A: It has changed considerably. For one thing, I find myself doing a lot of traveling on the campaign trail, which makes it difficult for me to fulfill my daily work at the UN. From mid-July I have in fact decided to take leave for several weeks, both to concentrate on my campaign and to avoid any perception of a conflict of interest. Q: Do you think this nomination can clash with India’s aspirations for a permanent seat on the Security Council? A: No. The two issues are unrelated. Security Council hreform is a structural issue at the UN. Many countries believe that the Council hreflects the geopolitical realities of 1945, not 2006. Member states have been discussing hreform for over a decade, but have yet to agree on the shape of that hreform. I sometimes joke it’s like a bunch of doctors gathered around a patient who all agree on the diagnosis, but disagree on the prescription! Until there is agreement amongst two-thirds of the member states about a formula for council expansion, there won’t be a framework within which India can seek a permanent seat. That will take time, whereas the SG race will be settled one way or the other within a few months. Some point to the convention that permanent members of the Council cannot put forward candidates for SG, and suggest that disqualifies India. But that unwritten convention resides on the fundamental principle that no one country should have both the right to initiate action at the UN (through the SG) and stop action (through the veto). India is not currently a permanent member of the Security Council and should it obtain this status it has already agreed to forego the veto for 15 years, so this argument does not apply to India. The next SG is not going to have to face a veto-wielding India. So there is no obstacle to India pursuing both objectives. Certainly it shouldn’t have to deny itself the secretary generalship in the name of a security council seat it doesn’t actually have! Q: You have written extensively and are very respected as an author. Yet all your books have dealt with India. Can that be seen as a negative, affiliating you with India in people’s minds? A: I write about what moves me and that happens to be India. But my writing has never affected my work for the UN – in hrefugees, in peacekeeping, in the SG’s office, and now heading a key department. My writing is one way of responding to the world, my work is another. I’ve tried to keep the two apart: in my work I have never dealt with India, whereas in my writing I have dealt with nothing but India! At the same time both emerge from the same individual human being. My outlook and imagination have been shaped at least as much by my growing up in India as by my international working life. Q: On the other hand, you do bring the rare talents that define good journalists and writers – objectivity and observation. Do you think your ability to stand back as an observer and see the world for what it is and the objectivity that writers need to create an imaginary world will stand you in good stead? A: Yes, I hope so, but it will never be a bloodless objectivity. One must care; there must be engagement with the great issues of our time. I believe I do have the capacity to see both sides of every issue, to step back and see the larger picture, take the longer view. That is as essential in an impartial UN secretary general as in a writer. But so also is a passionate commitment to work for a better world. I hope that comes through too in my work as well as in my writing. Q: Do you think your high visibility in the international world of letters and close connections to Kofi Annan’s administration plus points or negatives? A: Plus points, I hope. I am not going to run away from who I am or the life I have led so far. I hope that my literary credentials will bring new sources of support to the UN. Not too many candidates for this kind of job have been endorsed by Mira Nair and Bernard-Henri Levy! As for closeness to Kofi Annan, I am proud of my association with one of the great secretary generals in the UN. But we are different people. I am my own man and I hope I will be allowed to make my own mistakes. Q: Would some feel that your commitment to writing would interfere with you giving your undivided attention to the needs of the top job at the UN? Or is writing like breathing, a natural must for you? A: It is, and yet I wonder how on earth I will find either the time or the space inside my head to do any personal writing. Already in my current job I find it difficult. I suspect that in the secretary generalship, it will be near impossible, because modern communications have truly made it a 24/7 job. Amazingly enough, Dag Hammarskjold wrote every day; in addition to his Markings, which was published posthumously, he translated many European poets into Swedish and was working on a translation when his plane crashed. He also wrote other articles I remember reading a piece he wrote for National Geographic after a visit to Nepal on behalf of the UN. Maybe it won’t be impossible to do the same, but those were different times. Q: Now that you have been nominated, what are the next steps? A: Persuading a majority of the members of the security council to support me and ensuring that none of the permanent members veto me. There’s a non-binding straw ballot due on July 24, after which candidates campaign and perhaps new ones emerge. The council will probably have several more ballots in September and October, following which they send one name to the General Assembly, which usually ratifies it without debate. Q: How has your family reacted to the nomination? A: A mixture of excitement and dread. My sons think it’s cool, but they are careful not to get engaged in this. They are independent adults now, entitled to their own views on world affairs, which are not necessarily mine. My sisters are following the press accounts avidly. My mother says she’d much rather I had a peaceful life. But those who had the most fun of all were undoubtedly my uncles, aunts, cousins and grandmother back in Kerala, where the media really made a huge fuss about my nomination and they were on TV every day for a week! 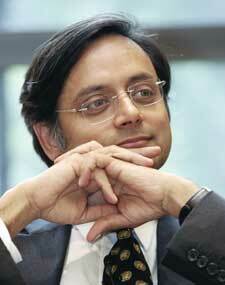 Q: Are we going to lose Shashi Tharoor the writer if we gain Shashi Tharoor, UN Secretary General? Are you working on anything currently? A: It won’t be a permanent loss! One day I’m bound to be known as a former UN official, but I hope never to be known as a former writer. I did begin a novel three Christmases ago, which I haven’t touched since then. But perhaps the Security Council will vote unanimously to return me to the world of letters! Q: You have traveled all over the world on conflict resolution assignments. What has been the most heart-rending and which made you want to change the way the world operates? A: I don’t have a “favorite tragedy”. Every one of the situations I have seen or dealt with, whether it’s the Vietnamese hrefugees rescued at sea, the Ethiopians in Somalia, the Nicaraguans in Costa Rica, the suffering Bosnians, Croats, Kosovars and Serbs in the Balkans, every one has been heart-rending in its own way and deserving of the deepest human compassion. I doubt we will ever be able to end man’s inhumanity to man, but we can certainly improve the way the world operates in responding to such crises, so that we can end the suffering more swiftly, both by stanching the wounds and by healing the cause of the injury. Q: You have written extensively about Nehru and how your views have been shaped by him. How is your relationship with the Gandhi family? A: Cordial but not close. I was pleased to discover that Ms Sonia Gandhi had read my book on Nehru, but I did not interact with the family in writing it. I have made no secret of my criticism of Mrs Indira Gandhi, in particular over the Emergency. Q: Again, you have written critically about the Hindutva movement so how has your nomination played out with the BJP? A: My views have been on issues and values; they are not partisan positions. I have not criticized or supported any particular political party. I was therefore particularly gratified that all the major political parties in India have endorsed my candidature and that former Prime Minister Atal Behari Vajpayee, as well as Leader of the Opposition L.K. Advani, received me personally to express their support. My candidacy has been seen in India as a national choice, not a partisan matter. And that is as it should be. Q: Finally, a wish list. What would be the changes you’d like to bring about if you become Secretary General? A: The challenges are enormous: the threats of the 21st century are what we sometimes like to call “problems without passports” – problems that cross all frontiers uninvited (climate change, drug trafficking, terrorism, epidemics, hrefugee movements and so on) – and whose solutions also can have no passports, because no one country or group of countries, however rich or powerful, can tackle them alone. My objective would be ensure that the UN is ready to tackle these problems effectively, and be ready for new and unpredictable ones – three years ago, who had even heard of the grave risk of avian flu? I will seek to ensure both continuity and change. And that means the UN must embrace sensible hreform…. And in the broader world, if there’s one thing I’d like to change, I wouldn’t say “abolish war,” because I don’t think that’s realistically possible. What I’d say instead is “educate girls.” It’s the one thing that can transform the world. Educate a boy and you educate a person; educate a girl and you educate a family, a community, a society. Educated girls become better-informed mothers and more empowered human beings; they are less vulnerable to AIDS and other diseases; they bring up educated children. That would be my crusade – to end female illiteracy.